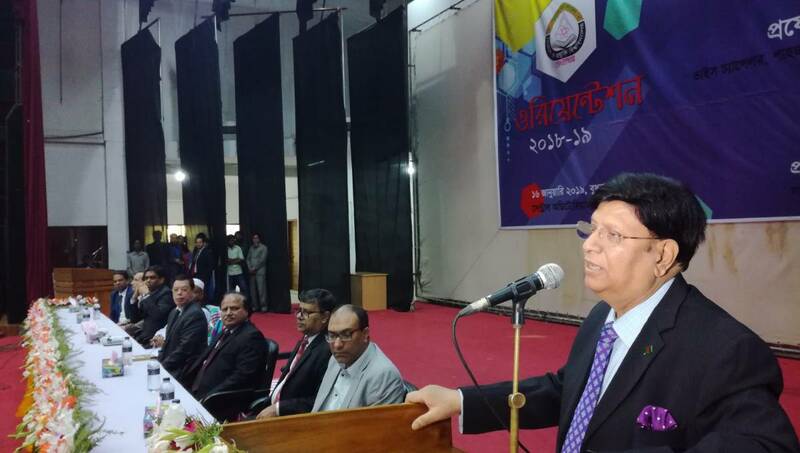 Photo: Foreign Minister Dr AK Abdul Momen addresses a two-day freshers’ reception at Shahjalal University of Science and Technology (SUST) in Sylhet on Wednesday, January 16, 2019. SUST Correspondent : Foreign Minister Dr AK Abdul Momen on Wednesday said Sylhet will be the country’s first digital city where its residents will get free WiFi access at each and every point of it. The minister said this while addressing a two-day freshers’ reception at Shahjalal University of Science and Technology (SUST) here. “Skilled manpower is needed to turn the city into a digital one as well as to manage the system, and you (students) will have to take the responsibility to maintain it,” he said. “The country’s financial status has improved greatly. There’s no ‘Monga’ in the country any more. We’ve established ourselves as a developing country and we also have moved up a lot more in social index compared to our neighbours,” he mentioned. SUST Vice-chancellor Prof Farid Uddin Ahmed presided over the programme while Treasurer Prof Elias Uddin Biswas, President of the admission committee Shamsul Haq Pradhan, its member secretary Zahir Ahmed and Registrar Ishfaqul Hossain were present as special guests.